The Cumberland & Dumfriesshire Farmers Mart P.L.C. 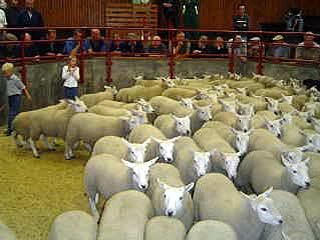 had forward 3,657 store & breeding sheep at their weekly sale at Longtown on Tuesday 26th January 2010. Another good show and with all buyers present trade was dearer. Top of £95.50 for Texels from Mossband House, £91.50 Halton Lea, £90.50 Chapel Farm; Suffolk £92.50 Broomhills; Cheviot Mule £83.50 Branteth; North Country Cheviot £80.50 Haithwaite; Charollais £79.80 Chapel Farm, £77.80 Branteth; Blackface £77.50 Lamperts, £73.50 Tecket; Greyface £77.20, £75.50 Barnshangan, £75 Tyrone House; Half Bred £76.80 East Murkle; Lleyn £75.50 Chipknowe; Beltex £75.50 Drummuie; Hill Cheviot £73.50 Glendearg; Romney Marsh £69.50 Haithwaite; Swaledale £67.50 Farlam Hill; Herdwick £58.20 Farlam Hill. Cast ewes £96 Lhaid Croft, hill types £64.50 Sewing Shields, cast rams £69 Meikledale. In lamb ewes met a great trade and short of requirements. Top of £150 for Texel crosses from Hownam Grange, who also sold Cheviot Mules at £135 and Leicesters at £120; Dorset £110 Tyrone House.